​As I round out another year, I am reminded of the year when it all began. Picture it: circa 1995. I am a nineties kid by birth, but I had the best of both worlds because my childhood nostalgia covers parts of two great decades. At some point in the last year or so, I feel like I am reliving some of the nineties’ glory with fads returning and revivals of music groups and television shows. While some things are better left in the past, I think it is a perfect time to take a trip down memory lane. I do not remember a time of not having Ty Beanie Babies. I have to have almost all of the original collectible ones, and you best believe they all have their tags on them. Some even have a plastic protector and in a special box to keep them in mint condition. You know, for the day when they skyrocket in value, and I am crazy enough to sell off a chunk of my childhood. 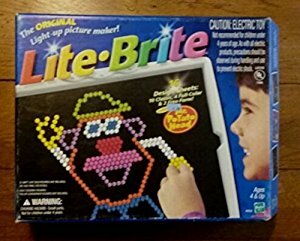 ​Before all of the technology came about, I, along with many other kids, was enthralled with the Lite Brite. If you have no idea what I am talking about, you sure missed out. Who knew colored pegs and a lighted box could provide countless hours of entertainment? Much of my time playing was spent with undivided attention to meticulously placing those pegs in random patterns. It was therapeutic in a sense. ​Pez dispensers came long before the nineties, but I think I was on a special mission to collect as many as I could. I am beginning to think that a craze in and of itself of that decade was collecting random novelty items in hopes of cashing in big years later, but as for me and my eight-year-old self, I enjoyed playing with them more than I liked eating the chalk-like candy that came with them. Nonetheless, I looked forward to every chance I got to pick out a new one and hunt for the rare ones. ​I had my fair share of stick-on earrings. Those were precursors to actually committing to pierced ears. I wore those things like they were the real deal, and I do not know who I was trying to fool because looking back, they looked nothing like real earrings. I eventually graduated to clip-on earrings. Those did not last long. I had lost one too many, and my dad had searched for one for the last time before my begging got me somewhere. And that was to Piercing Pagoda to finally get my ears pierced in Pre-School. While waiting a couple of years does not seem like much, it felt like an eternity for me then. ​Among other shows, Lizzie McGuire was one of my favorites. From the books to the show to the movie, I was hooked. You have no idea how much I wanted to be able to do a Disney intro with the glow stick and trace the Mickey Mouse ears in the corner of the screen like Hillary Duff would before the start of her show. I would wait for her to do the intro and have a baton handy to mirror her and then use the same baton as a microphone to sing my heart out to the theme song. I wanted to be ready for any Disney Channel opportunity that came knocking my way. Needless to say, I did not hold my breath on that one. ​Lisa Frank was all the rage when I was in elementary school. The school supplies were glorious, and I can still remember picking out pencils and folders. All the things! I had the same Lisa Frank lunchbox for four years, and I loved that thing. I still have it in my basement with some other school things I refused to part with, so it still lives on. I thought it was coolest lunch box, and honestly, if it were acceptable, I probably would still use it. On second thought, I think it is better left in my younger days of use. ​I am not sure why butterfly clips were so popular, but I was guilty of the trend. My mom would section off my hair and place them strategically. I can still remember putting five on my right side and four on my left side. While the colorful variety of butterfly clips was plentiful, mine were iridescent and were only pulled out for some special occasions. When I felt like being fancy, I would ask for them, and if I were really milking it, I would get my hair curled too. Oh, to be little again. ​Me and M&Ms have basically been inseparable from the start. Now, I love the original just as much as the next person, but there was a special place in my heart for the crispy M&Ms. I was heartbroken when they were no longer available. I took it harder than a normal person should have, and even though the Mars company came through with a remake, nothing will beat the first crispy M&Ms in the blue packaging. ​Every nineties girl had an extensive stash of Lip Smackers flavored lip balms. Even though I went through many Tootsie Roll lip balms, my absolute favorite one had to be the Lip Smackers Flip Balms. Those were the best! If they were still available, I would definitely have one (or a few) stashed somewhere. Not only was it an accessory must, but it was also satisfying to flip it open and click it shut. I should have known then that I would end up having a lip product obsession. My parents started a habit young. ​I still have a place of nostalgia in my heart for all of the products I loved growing up. My childhood was great, and I would not change anything. Well, maybe a few questionable fashion ensembles, but I cannot take full responsibility for those. I could go on about some fun blasts from the past, but I will put a close on this chapter here for now with the nineties’ top nine. I have been fortunate to be part of an amazing student organization since attending The University of Toledo. The National Student Speech-Language and Hearing Association (NSSLHA) is devoted to bringing awareness to speech-language and hearing related issues, academically and medically. One of our main outreaches and fundraisers is the Operation Smile 5K. Operation Smile is a nonprofit organization that makes cleft lip and cleft palate surgeries to children in third-world countries where these types of surgeries would otherwise be impossible. It is a cause that is near and dear to all of our speech pathologists’ and audiologists’ hearts. Our annual event took place on a perfect Sunday morning. I love seeing a group of students, families, and friends come together to support a cause that will impact the lives of so many children. Correcting cleft lips and cleft palates are crucial to a child’s health, so it made the day that much sweeter knowing what this day meant for our field and those impacted by the funds we were raising. At the end of the event, NSSLHA and our friends raised money that will surely make the difference and bring many smiles to children and their families. We went the extra smile to give the world a smile. I am stepping out of some comforts with this one. I acknowledge it, but I never talk about. It is hard for someone to understand this when it is not always seen or talked about. This deserved to be talked about, and I hope my story positively contributes to bringing light to unseen chronic illnesses. At the young age of ten, I began fighting the unknown and hoping it would all go away. By the time I was thirteen, my enemy had a name. In another year, the battle spread. Years later, I am still fighting. No one asks for this, but here I am, as a twenty-one-year-old, not letting Rheumatoid Arthritis win. My story begins in fifth grade. I was in gym class and on the way outside to play flag football, I tripped and took a hard fall. I shook it off and went about playing, but something felt off with my knee after it caught most of the fall. Fast forward to sixth grade; I had grown two or three inches that summer. Presidential testing for athletic skills was upon us in gym. One of the goals was to run a mile in a certain time according to our age, so we were pushed to run harder than I would normally have. The constant pounding on the gravel about did me and my knees in, but only one gave out completely. The swelling was unlike anything I had ever experienced. With great alarm, the first of many appointments with doctors began. The first few appointments to multiple doctors did not get too far. The unknown proved to be a challenge and most concluded with my pain and swelling caused by growing pains from my rapid growth spurt, and it would all go away eventually. I thought that was a stupid diagnosis, but who was I to question a doctor with an expensive medical degree? I continued with my middle schooler’s life, with the exception of not participating in gym class for the rest of sixth grade. Another school year began, and seventh grade brought more pain but no more answers. I tried again to join in on gym activities, but that was short lived. Something was obviously wrong. Seventh grade was the year I was determined to get to the bottom of this. And while I did not get the answers this year, I was closer to them. One doctor led to another, and by eighth grade, I found myself at the University of Michigan. The head of Juvenile Rheumatology finally got to the bottom of my problem, and I thought things would soon go back to normal. Normalcy was not quite achieved. I never returned to playing in gym class. I limped for over a year. I had to miss out on school skating parties. I was in pain every single day and often had to leave class to take medicine in the office just to get through the rest of the day. What kid wants to do these things or not do things because of Rheumatoid Arthritis as a middle schooler? What I thought normalcy to be was now a thing of my past. High school came around. I had a pretty good start to the new adjustments, and I thought I was getting a strong hold on controlling my flares. There was something that felt wrong with my wrist. I had been working hard on huge projects and was feeling rough. I shrugged it off until I could not stand the pain any longer. The night of parent-teacher conferences was cut short and ended with a trip to the emergency room at the University of Michigan. In an instant, my ninety-percent chance of growing out of the form of Juvenile Rheumatoid Arthritis I have diminished to only ten percent. Being as young as I was when Rheumatoid Arthritis struck, I had no concept of what it really was, and my understanding of its effects was slim. I had high hopes of growing out of this someday. Those hopes were still something I held onto even after my chances dwindled. As time passed, my arthritis spread even more, and my flares became more severe. My chances of ever escaping its grasp are completely gone, but that does not mean I will stop fighting and surrender to its fate. Every day is a struggle to control the chronic pain that comes with this disease. The exhaustion is never-ending, and no matter how hard I try, the tiredness does not go away. It is easier to reply ‘I am fine’ when a person asks how I am because it is easier than to explain why I am not. Rather than diving into the saga of my reality, I seem like nothing is bothering me. I smile to cover the pain. I cry in the shower, so the tears go unnoticed. I may have a good day and feel like I can attempt to conquer the world, but I will most definitely pay for it later, and it will take days to get over. I had no idea how real brain fog truly was until I experienced it for myself. When the pain is too much to bear, I still have to put on a brave face and push through a day, and that proves to be the ultimate challenge when even my head is not in the game. Those are the days I am better off staying in bed and binging on whatever Netflix has to offer, but more times than not, I muddle my way through school and hope I remember enough of the pieces to get by when it comes to exam day. I may joke about being a young person trapped in an old person’s body, but the reality of it is this is my forever. It is beyond frustrating when my head says one thing, and my body retaliates against the thoughts of having to go through anything remotely strenuous. I choose not to talk about this part of my life on a regular basis. I do not want people to look at me differently or treat me like I am dying. Because I am not. Rheumatoid Arthritis does not define me. Although I cannot control when it flares, I can control how I take the punches and roll with them. Chronic illnesses and autoimmune diseases are real, and even if they are not always seen or talked about does no invalidate the impact they leave behind. I wish I would have known about other people’s stories and journeys dealing with Rheumatoid Arthritis. It was not until I read a story on TheMighty.com that I realized someone else had the same thoughts and struggle I have. Her story sounded so much like mine, and without knowing her or talking to her, I felt a connection. That mattered. There is no RA-101 guide for being struck with a lifelong illness, and there surely is not one that gives you a heads up on how it will change a person’s perspective. Nothing about this is fair. No one wakes up one day and hopes for it to strike. The most irritating thing I have come across is the reactions and responses people give when they find out I have Rheumatoid Arthritis. While some are seemingly genuine and delivered out of concern, some are just plain ignorant and rub me entirely the wrong way. ‘You are too young to have this,’ they say. ‘Feel better, rest up, and it will go away,’ they say. While my first instinct is to roll my eyes as far back as they will go, I have to work with myself to keep from blurting out ‘like my young age should be an automatic repellant for such a thing,’ or ‘let me get right on that,’ as if a chronic disease is going to suddenly go away with the help of a nap. I know that sounds harsh, but after hearing those things from random people for years, it begins to sound like a broken record and constant reminder that is not going to go away, but they do not know that. I have lived more years with Rheumatoid Arthritis than I have lived without it. For over half of my life, Rheumatoid Arthritis has been a part of it. I do not remember what it feels like to feel good anymore. I cannot recall a time in life that every joint in my body did not snap and pop. That is a daunting feeling to know that I will always have more days lived with Rheumatoid Arthritis than I will have without it. There is no going back to the days of not having to face the challenges living with Rheumatoid Arthritis brings. October 12th is World Arthritis Day. It is the one day out the year we shine a light on this disease. Stories get told and read on this day and not talked about again until the next year. Not enough people make it a priority to put a name and face to invisible illnesses, myself included. It is not like it is going to go away, so I might as well embrace it, as much as I hate to. I cannot deny its existence, and I owe it to myself to speak out to tell my story to hopefully show to someone else they are not alone. I reached a pivotal point when I knew others had the same thoughts and feelings I had to process through in life with Rheumatoid Arthritis. Just because it is not noticed every day does not mean it is any less of a problem for someone. So today and always, for me and for others, I wear blue. The transition from August to September always seemed to be the hardest for me, especially when I knew school was right around the corner. I did not take too kindly to have my summer freedom stolen by school’s confinement. Once school got going and my routine got established, I was fine and enjoyed going. It was the transition that was my biggest enemy, and the proof is in the picture. If you could not tell, I was less than thrilled to begin my Kindergarten year. Luckily, it got easier through the years, well, sort of. I still dread the transition, but I put up less of a fight. I remember my first day of Kindergarten vaguely. Given my usual track record of the days I do remember from school, there were probably tears and puppy eyes begging to stay home. The idea of coming around to looking forward to the school days ahead of me began as I stepped foot on the school bus that picked me up, and it could only go up from there. School was good for me. It was not only good in the sense of providing me my education; going to school was my chance to make my own friends and become independent. After a couple of years of having rough starts to the school year, I reached a point where I could not wait for school to start back up the following year. The tables had turned, and I realized that school was my happy place. Sure, some days were harder than others, and it was not always a cakewalk, but as I look back at those days, I know I was on my way to making the best out of every opportunity. Summer is still something I look forward to, and by the time I am done with my semesters in college now, I am beyond ready to recoup from the madness that ensues during the school year. It also helps that my summers are longer now, so going back to school means seeing friends again and jump starting my campus involvement with my various organization affiliations. I do not let go of my summers easily, but if I have to trade them in for something, I am willing to temporarily hand in my summer days for school days. I had a serious case of separation anxiety when I was little. That may be hard to believe after looking at my last few years’ worth of traveling and venturing somewhat out in life. Even going to school proved to test my anxiety and it was a struggle every morning. If my morning routine was slightly upset or if I knew my parents would not be home while I was at school, my day got off to a rocky start. I enjoyed school, but I did not like leaving my parents or being away from home too long. It was complicated. ​Aside from my separation anxiety, I had a hang up when it came to sleeping over at other people’s houses. I had zero desire to spend the night at anyone’s house; it did not matter who the person was. I cannot count the times I would be brave going into a sleepover but end up crying to come home around bedtime. Luckily, my parents always came to get me, and it helped that these little trial runs were only five minutes down the road at my grandparent’s. I knew better than to pull a stunt like that too far away from home, but it would not have flown regardless. I finally got gutsy enough to spend the night my grandparent’s house, and my first successful sleepover went off without a hitch. It is not like I was signing up for a horrible night; I just could not figure out why anyone would give up sleeping in their own bed to go away to sleep in someone else’s. I never said my kid logic would ever make sense because my hindsight of my angst towards sleepovers is still a mystery to me. Looking back at my adamant stand against sleepovers for years, I was well into elementary school before I could sleep at a relative’s house, let alone a school friend’s house. That phase in life still took a few more years before I could commit to a slumber party. Now, I can freely go and not think twice about it. As evidenced by my stays abroad, I have come around to liking the idea of going someplace new and exciting. It makes me laugh at my childish ways compared to how much I looked forward to leaving home to go to Europe. I am reminded of one of my favorite movies and the scene where Princess Mia marched in her parade to the Kelly Clarkson song, “Breakaway.” I see myself in the girl who was timid and sucking her thumb, and I would like to think I have grown and am beginning to spread my wings. That song became my anthem when it came time to do just that: spread my wings and learn how to fly. Oh, how times have changed since the days of my sleepover no go. Keeping traditions have not always been my family’s strong suit. Although, there is one we established and have managed to stay true to it almost every year for twenty-one years. It all began on my first Independence Day. I was almost seven-months-old, and my dad had just planted a tree in honor of my new appearance on earth. My dad wanted to document me through the years, and the metaphor of the tree growing along with me would later mean something to me. While most parents would designate a door jam or have a custom measuring stick to document such a thing, my parents went the unconventional route to document my growth. It used to bother me that every Fourth of July meant I had to take a picture by a tree, but as I have gotten older, I get excited to take my yearly photo there at my tree. I thought it was stupid, but now I recognize the metaphor and meaning of comparing my growth to the growth of a strong tree. That tree has weathered numerous storms and endured twenty-one years of taking whatever comes its way. The same goes for me and my life. I appreciate what the symbolism stands for, and I think my parents did something neat for me the day they planted my tree. Whether the purpose was to establish the metaphor or not, that is how I view my tree, and that is special. Some years have gone by without snapping a photo on the holiday. But, for the most part, I have a complete collection to tell a story. There was never a pose or outfit I had to have each year. In fact, some years were taken in a bathing suit or in whatever outfit I was wearing as we headed out to celebrate. Nothing about my yearly photo shoot was planned. It just happened, and that is what I love about them. My tree sprouted about the same time I did. And with each new season, a new leaf is turned. Being an only child had some major perks. I had a front and center spot in every living room performance. Shy is not the best word to describe me as a child, but I was not overly willing to dance and sing outside of the comforts of home. I have always loved music. I cannot remember a time when there was not music playing in the house, so I fell right in line with the trend as I gave my performances. I would spend an afternoon setting up and practicing my routine. To announce my concert, I made posters and handed out tickets to my parents. My dance costumes served a double purpose as my show outfits. I even incorporated some toe taps just so I could wear the shoes. Even though I did not know how to play the piano or any of the other instruments I had, I gave it a valiant effort to act as I did. It did not take any batted eyelashes or puppy whimpers to convince my grandpa to join in on my concerts. He never passed on an opportunity to play and have fun with me. We would connive our plans to get out of doing the kitchen work while dinner was being made, and then we would go off and get things set up and ready for an after-dinner show: The Grandpa and Kayla Show! He loved participating in my shenanigans, and deep down at heart, he was a kid himself. I was by no means destined to perform on Broadway, nor was I dead set on becoming the next American Idol. The show stopped there, but looking back at some pictures of those concerts, I definitely earned the title of the next living room rock star. I may not remember everything that ever happened in elementary, but this one big event I do vividly remember. It was the third- and fourth-grade play. This was my second play that I participated in during my elementary experience. My first time was a small part in Peter Pan the year before as a third-grader. When spring rolled around during fourth grade, I was excited to audition and make the most of this experience. I do not remember exactly how audition day went. I cannot say what my dry-run lines were or what my critiques were. I do not even remember what part I was actually auditioning for. I do recall running lines with my mom in the hallway of my elementary school. Auditions were held in the cafeteria after school one day, and that was it. By Friday of that same week, the play director made her rounds to the classrooms revealing the parts. This part I do remember well. She had announced everyone’s part and handed out their scripts. I was the only who she had not mentioned yet. It felt like an eternity waiting to hear what part I had gotten. I heard my name called, and my heart jumped to my throat. When I had heard I landed the role of Snow White, I jumped out my seat and hugged our director. It was probably a good thing this news came towards the end of the school day because I could not wait to get home to tell my parents the good news. Weekly rehearsals began, and I loved every minute of it. We would run lines on and off stage, so we learned how to help each other and exchange pointers. It was a chance for us to make memories and connect over a shared goal. In addition to rehearsing the play, we had an opportunity to help on set in different areas. My parents were the typical stage parents, and they were quite involved. They made an effort for at least one of them, if not both, to be at every rehearsal. My dad was helping to build and paint large set designs, while my mom spent much of the rehearsals sewing my costume and helping other mom volunteers sew the other costumes for the play. They spent many afternoons alongside me, and it is fun to look back to see how involved they were in my extracurriculars. The day of the show finally arrived. It was a busy day for the fourth graders. The first half of the day was spent doing Mini Society where groups of people marketed and sold various items. For my friend and I, we sold lemonade at LinKay’s Lemonade Stand. Even though our time to sell was cut short because we were both in the play, we still managed to make the most of our classroom money in our class. We were shuffled to the high school to get ready for our first performance for our classmates. My mom whisked me away to a private room to change and get ready while the rest of the cast were all together in a different room. Showtime approached as we took some behind-the-scene photos to commemorate the day. Our first performance went well. I consistently left out one line during many rehearsals, so the fact that I missed it during a performance was of minimal consequences. Getting this smaller performance out of the way eased my nerves for the later performance. The time between my first and last performance went by as slow as molasses. I was looking forward to the evening performance because a big part of my friends and family were coming. The final curtain call of the evening show was perfect. My dad brought flowers to give me, and my family was perched in the front row. It was as close to the fairy-tale ending I had hoped for from being Snow White. My friends and I were all smiles as we soaked up every minute of the applause. To a fourth-grader, the attention and camera flashes were almost more than I could process. It was fun to see our hard work pay off and captured perfectly in the day’s activities. Even though I loved playing the lead in the school play, I realized acting was not my calling. It was an experience I will never forget. We had t-shirts made for the cast, and I can still wear mine eleven years later. It may be a little faded, but the memories are not. The days of elementary school are long behind me, but it is fun to reminisce about the days when I was the fairest of them all. My life’s goal (as a three-year-old) was the have a playhouse. I probably would have been satisfied with one of those plastic ones that can be bought and assembled in an afternoon, but my dad took this playhouse thing to a new extreme. It turned into a summer’s job and took a whole slew of people to complete. I guess being an only child had some major perks when it came to an over-the-top playhouse construction. The shell of my playhouse was an old garden shed, but it was not going to be like that for long. With new windows cut out, a front porch added, and a few coats of crisp white paint began the transformation. My dad and grandpa were the contractors, while my mom and grandma were the interior designers. And, of course, I was the supervisor of the entire project. I may have been little, but being the boss was the best job to have. My main concern for the project was having enough pink and purple integrated into everyone’s area of the build. My requests were heard and fulfilled. This was not an ordinary playhouse by any stretch of the imagination. It was the Taj Mahal of playhouses. My dad laid linoleum flooring with carpet squares to show the different rooms. My mom and grandma sewed window coverings. I had life made. My dad and grandpa even went as far as building shelving units, a refrigerator, and stove. The refrigerator was not complete without a place for magnets, so that feature was soon added. Landscaping was not exactly my area of expertise, but that did not stop me from only requesting pink and purple flowers. All I knew is that I wanted certain colors, and they had to match the watering can I had when I was little. I never said my toddler logic had to make sense. With flower boxes and everyone’s help, the playhouse was finally coming together. The final touch my dad added was a porch swing, because no playhouse is complete without one. I was so happy with everything. My mom and grandma spent an afternoon filling the shelves and refrigerator with play stuff. A trunk of dress up clothes made its home in the playhouse too. Everything was going great until the playhouse renovation was completed. I started crying and telling my parents I did not want it anymore. Keep in mind, I was three, and my processing skills were not there. I thought upon its completion I would have to live out in the playhouse and not with my parents in our house. It took some time for them to convince me of the purpose of the playhouse, but it was briefly traumatizing. I made many memories in my playhouse. Some days it was a restaurant and, other days, it was my favorite getaway to just color and sing my heart out. My family and I had a blast building my playhouse, and I know they loved every minute of watching me enjoy it for years after that. They went above and beyond my hopes to make my home of tiny dreams. I will openly admit I am not swiftly coordinated. I can trip over nothing, and my dance moves are far from graceful. When I was younger, my parents put me in dance classes for socialization, because even they knew nothing could fix my dancing or coordination. I started out in tap-and-tumble and ballet. And needless to say, the ballet lasted all of three seconds; it was swapped out for hula. So with all of my years combined, I cycled through about four or five styles of dance. Although my time at a dance studio was short lived, I have plenty of stories to share. I guess the best place to begin is the beginning. My first class was tap-and-tumble. Now is probably a good time to mention I cannot do a somersault without going crooked, and my cartwheel is, well, not worth crediting as such. On the first day, I was put on a padded cylinder and expected to flip over it. I was terrified, yet forced to follow suit. The whole point was to get comfortable with doing flips, but there was not enough practice in the world to get me ready for my recital. The stage at the recital venue was seemingly huge compared to my little, four-year-old self. The bright lights hindered my ability to see the edge of the stage, so after my tap routine, I was hesitant to do the tumbling portion. The last thing I wanted to do was flip right off the stage and into the front row of parents. My toe taps and heel scuffs were the least of my worries. I obviously lived to tell this story, but I honestly cannot remember if I completed the routine in its entirety. I was not destined to be a ballerina, but hula seemed interesting. What an experience that was! Everything was going swell until one day. It was the one day of the dance season the parents could watch through the window and watch us practice. My dad had perched himself so he could see me, and I was excited to show off my figure-eights with the poi balls. The one thing I was remotely good at soon became a disaster when my strings got tangled with the girl’s next to me. Before I knew what had even hit me, Newton’s Law sent my poi ball boomeranging back and socking me right in the eye. Surprisingly, I did not burst into tears, but I dropped my strings and met my dad at the door. Although being hit in the eye hurt, my ego was hurt more because the picture window of gawking parents had just witnessed the height of my unfortunate coordination. My dad was ready to pull me from hula at that point, but I finished out the season. At the end-of-year recital, I nailed my figure-eights, but I left a little extra room between me and the other dancers on both sides of me. My final two years were spent in jazz and tap classes. I do not remember the exact dance routines I did for every rotation of classes, but my favorite ones were “Rockin’ Robin” and “Be Our Guest.” I distinctly remember the morning of my professional pictures in my costume for “Rockin’ Robin.” My mom stopped by my grandparents’ house to show off my costume. They had just painted the landing in their garage, and because I could not read yet, I was oblivious to the wet paint sign. With my tap shoes and costume on, I quickly regretted stepping on the landing. Not only did my tap shoes get a nice coat of grey floor paint on them, so did the back of my costume, because my tap shoes slipped out from under me, and I ended up on my tushie. My “Be Our Guest” routine was far less eventful than my other routines. I would even go as far as saying that it went off without a hitch. My tea set was hot glued to the tray, so there was less room for an accident to happen. This royal blue costume was by far my favorite one and my last one for that matter. To top it all off, the soundtrack for the dance was from Beauty and the Beast, and that was fantastic. I practiced my taps on a piece of plywood my dad cut for me, and my living room made a great practice stage. I may have had a small little mishap when I was dancing on the board without my tap shoes on and had a splinter go in my foot. An impromptu splinter-pulling session put my practice on a temporary hold, but I learned a valuable lesson. Soon, I was back to practicing (with my tap shoes on), and the show went on. The recital and my favorite dance routine put a closing seal on my dance career. These reminiscent stories of my dancing days brought a smile to my face, but I am happy they ended when they did. I could not justify my awkward dancing now, had I stayed in dance any longer. It was a fun experience, and I will forever remember the days spent in the studio preparing for recitals or riding in the county fair parade, but my dance moves were far beyond repair. I guess only in my dreams will I ever be a tiny dancer. ​​Growing up with a sign painter as a dad, a paint brush preceded crayons. My dad’s paint shop had a corner for me to play in while my mom’s sewing area was set up on the balcony. Most days, I was content playing with my toys or riding my bike around the barn, but depending on the type of work my dad was doing, I would scoot over to his side and offer my help. I was less inclined to help my mom sew, although I could thread a needle quite well. No matter how busy my dad was with trying to finish, he would always take the time to let me leave my mark on whatever he was painting. My favorite thing to do was to paint in the cow spots on Calder’s Dairy trucks. My dad would outline the spots, and I would take over from there. He looked forward to my help on those endeavors because it meant he did not have to sit on the floor to paint them himself. It really worked out for everyone: I was occupied, my mom could sew uninterrupted, and my dad created great memories with me. I left my mark on many signs and trucks, and whether or not the client knew, I felt special knowing I contributed to the cause. Although I do not specifically remember the photo of me in a romper and sweatband, I love this photo. It is the essence of the ’90s, between the romper and the frilly socks, but if I am being completely honest, I cannot help but think of Richard Simmons whenever I look at this picture. The fondest memory I have painting with my dad was the day I spent painting my own golf cart. It was something he said I could since I found out I was getting one. The golf carts arrived around October when I was in first grade, so the season to drive them was cut short by the arrival of winter. It worked out well because I did not want to drive mine without it being painted the way I wanted. And if you are trying to figure out how old I was, I was six, and yes, I knew exactly how I wanted it! I spent a whole Saturday in the barn painting my golf cart. My dad outlined my design with a grease pencil, showed me how to run the brush, and let me go to do my own thing. I was so excited when I finished the side I had been working on and then was reminded there was another side to paint. So I scooted my crate around to the other side with the paint and did the rest of the job. The rest of my design was a little too advanced for a six-year-old, so that is when my dad took over to add some details and leaves to my already perfectly purple flowers. When spring rolled around, I was so ready to show off my new wheels, but even with a birthday and a growth spurt, my short little legs still could not reach the pedals, so the obvious solution included blocks of wood and duct tape. Many projects have come and gone in the barn, but no matter who or what they were for, one thing is for sure. I will always hold the title of daddy’s little helper. So it begins; I step back in time to my childhood to tell stories and share memories. My first few months of life were relatively dull. I ate and slept, and well, you can fill in the rest. It was not until I was about eight-months-old that I was able to turn on some charm and do more than stare into oblivion. This particular trend of mine began when I was taken to a cookout. My dad was holding me at a table, and I was entertaining the older ladies sitting across from us. The longer we sat there, the more tickled everyone got. Apparently, I found them just as entertaining as I was to them. I began mimicking one of the ladies who was lacking in the dental department. I must have been extra cute that day, because the more I did, the lady would squint real tight and grin a toothless smile. I reciprocated the toothless grin; a cycle formed. Upon returning home from the day-long cookout, I kept flashing a cheeky and gummy smile at my parents. From their account of this day, I was having a ball and the more I did this, the funnier it became. I had no idea what I was doing, but it stuck. My dad coined my mimicking smile as the granny grin, while my mom snapped some pictures to fully document this trait I had adopted as my own. The granny grin would continue on into toddlerhood, and by request, I would tuck my lips to cover my little teeth, throw my head back, squint my eyes, and display the cheesiest smile I could muster. Once in a while, my dad would join me, and that was a sight to see. Unfortunately, I could not dig up a picture of us two, but maybe that is a good thing too (that is up for debate). The granny grin is one of my earliest memories recounted by my mom and dad. I will not live this down, nor be allowed to forget this as long as my dad still tries to get me to do it once in a while all these years later. I have no idea who that little, old lady was, but one thing is for sure, my family and I have had years of laughter all because of the granny grin.